For better or worse, technology is pervasive in the workplace, school and home. All industries depend on computers to maintain our quality of life, and many tech companies continue to experiment and invest in new technologies like artificial intelligence (AI) at an accelerated rate. The projected growth of unfilled STEM careers is old news to employers and educators alike as we face the facts of the future - today. Despite awareness, an air of change in the way we teach and learn is just beginning to sweep our nation’s schools. As we embrace a sense of urgency to prepare students for the future of work, many educators are turning to “21st Century Skills,” recognized as the 4 “C’s”: critical thinking, creativity, collaboration and communication. While the 4 C’s intend to equip students with transient and resilient skills, they do not address technical skills directly. Computational thinking overlaps key strategies to solve any given challenge through an analytical and methodical approach. Put simply, computational thinking teaches students to process information like a computer would. Computational thinking offers a framework for problem-solving, where one develops a series of steps (an algorithm) to solve open-ended problems. Introducing this new framework for how students approach everyday problems is no easy feat. 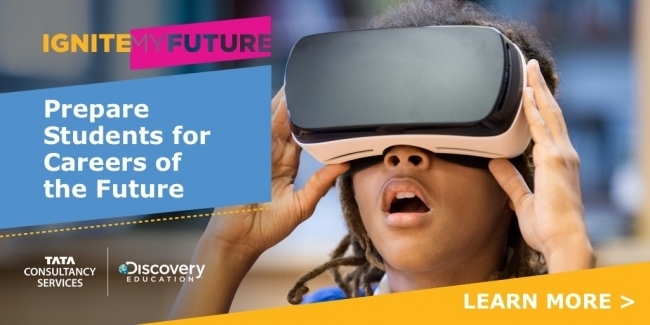 That’s why TATA Consultancy Services (@TCS_NA) and Discovery Education (@DiscoveryED) partner with schools nationwide to transform the way we learn across America through the Ignite My Future In School initiative. Ignite My Future in School has a goal of engaging 20,000 teachers and one million U.S. students by 2021. Aligned to national standards, the initiative provides teachers with an exclusive, cost-free, professional development experience that includes curriculum resources, eLearning courses and webinars. Since the launch of Ignite My Future In School in September of 2017, educators across the nation have introduced computational thinking as a transdisciplinary concept and adapted curriculum into every day lesson planning. Last week, during an Ignite My Future In School Computational Thinking in the Classroom webisode, educators convened virtually to share best practices for engaging students in computational thinking. Francie Snyder of Manatee County, Florida teaches students in the gifted and talented program. She attended the March 20th webinar as a guest speaker. Snyder utilizes the Ignite My Future In School activities by allowing her students to choose which one best fits their interests. One lesson in particular that stood out to Snyder was If You’re Happy and You Know It, an activity that guides students to examine and measure the science behind our emotions. Snyder said that the lesson addressed social issues in her classroom in a positive light. “When I find something like this I’m really excited. [The resources] are like a playground for teachers,” Snyder said. Unlike ordinary lessons, according to Snyder, activities are centered around collecting, measuring and analyzing real-world data, which are all foundational strategies to computational thinking. Making sense of data that students can visualize and experience in their daily lives makes for a profound learning moment, according to Snyder. “A graph is just a graph, data is just data unless it means something to you,” she said. Patti Grammens, a computer and science educator in Forsyth County, Georgia, echoed Snyder’s praise of lesson variety to personalize learning. She encouraged fellow educators who attended the March 20th Webisode to find lessons that fit student need and relate to ongoing classroom activities. Regularly scheduled webisodes are accompanied by additional Ignite My Future in School professional development resources, including TECHademy in-person training events and e-Learning modules. To learn more about adopting computational thinking at your school, visit www.ignitemyfutureinschool.org.